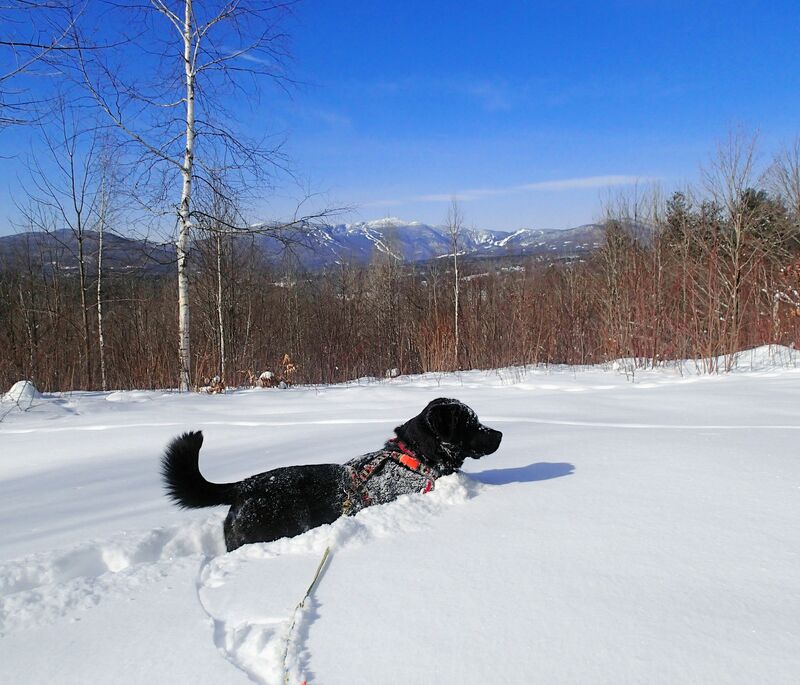 “Walk with me, hold my hand, and warm your heart….” | Vermont Paddle Pups! 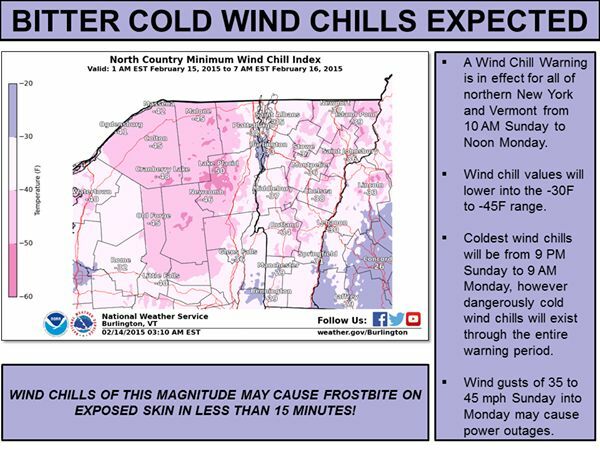 Yes, the weather continues to reinforce the notion of “hardy Vermonters”…though we have had frequent, moderate, accumulating snows, it is the cold which has put some limitations on our activities. We do have the capacity and gear to dress appropriately for the weather, but we have to consider 1. our safety, 2. the dogs’ safety, and 3. the fun factor ( will it really be fun to be battling dangerous conditions?). 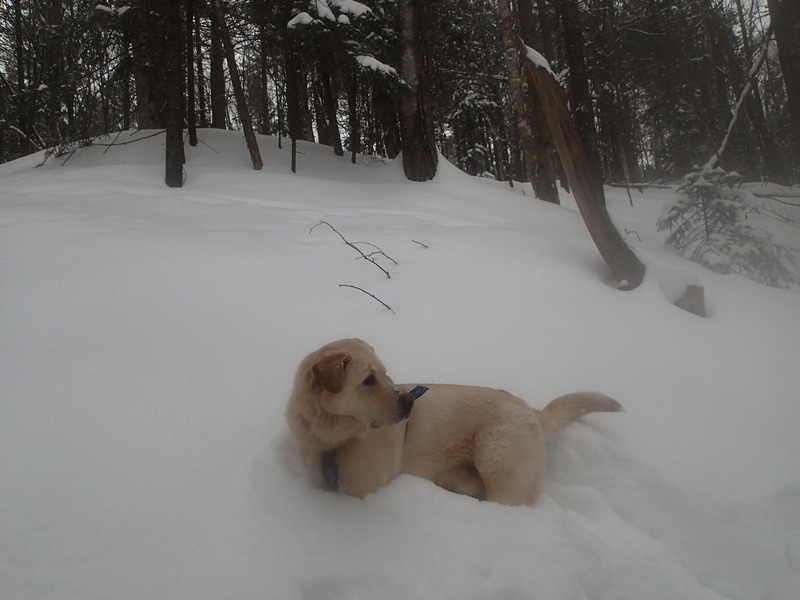 We have lots of snowy days ahead, and lots of time to play before real spring arrives… The steady influx of snow has made for some awesome snowshoeing conditions…so deep, that the dogs have each actually lost a bootie, which may or may not ever be found when the snow melts. 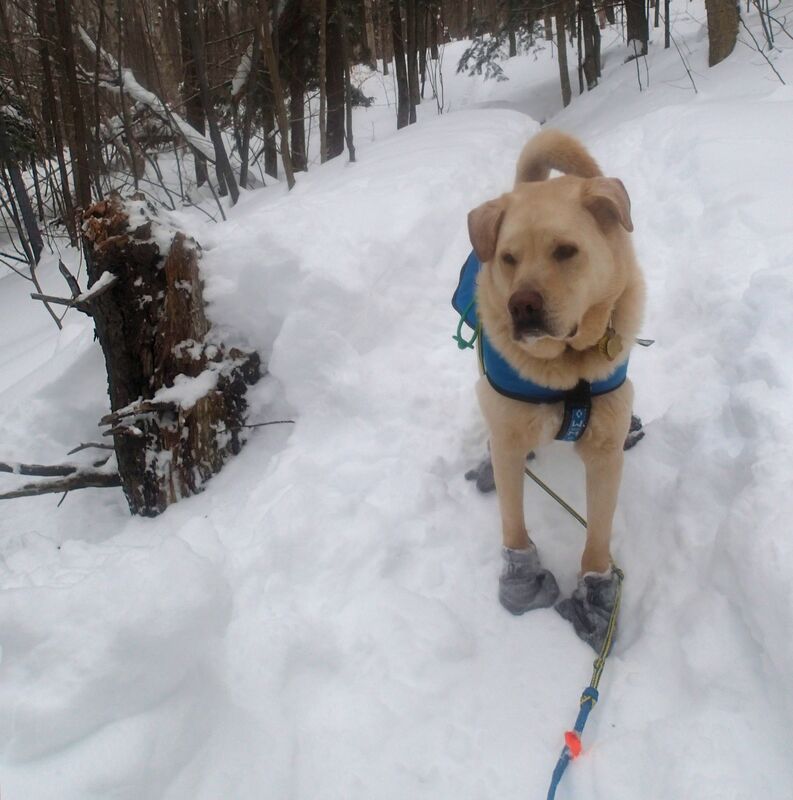 No worries, though, as I carry extra booties in my pack, and we use the inexpensive mushers fleece booties. I also keep paw wax in my pack, which can help protect those paws from the cold. I was keeping an eye on the full moon calendar, and hoping that the evening of Feb.3 would be clear, but not dangerously cold….it looked good, until flurries and clouds rolled in late afternoon. 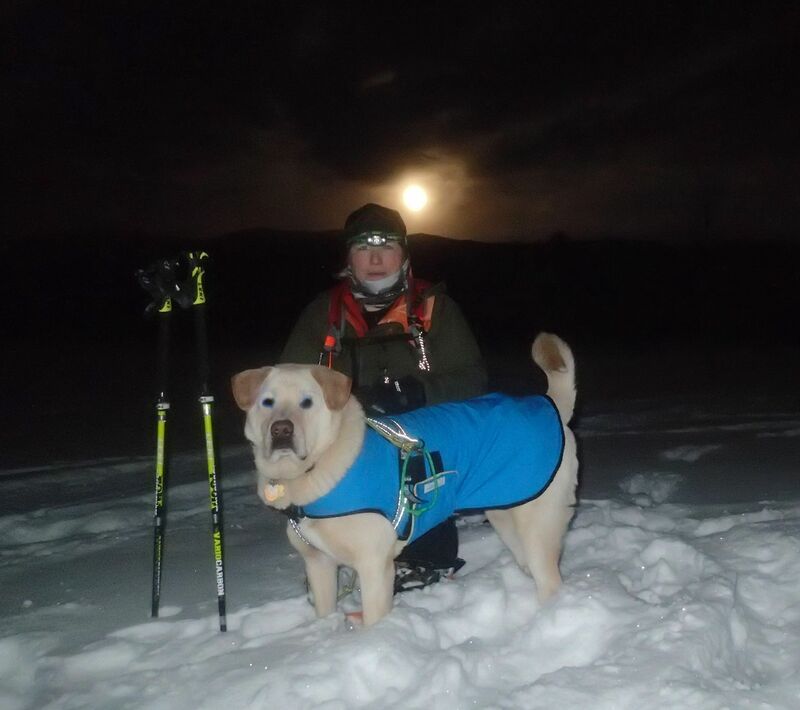 The temperature was near 10 (f), so that was not an issue, so determination kicked in, and Griff and I headed out for a full moon snowshoe. We were blessed with a glorious,golden moonrise over the reservoir…the snow was soft, and there was not a sound to be heard. My small camera actually was able to capture some of the beauty…. We also checked out the snowshoeing at Perry Hill, a spectacular mountain biking network ( that is closed to bikes until May). The heel lifts on my snowshoes came in very handy on some of the steeper climbs, and the trails we found were soft,very snowy, and beautifully meandering through birch stands, and piney woods. A light snow was falling, and with temperatures around 20(f), conditions were perfect for snowshoeing. 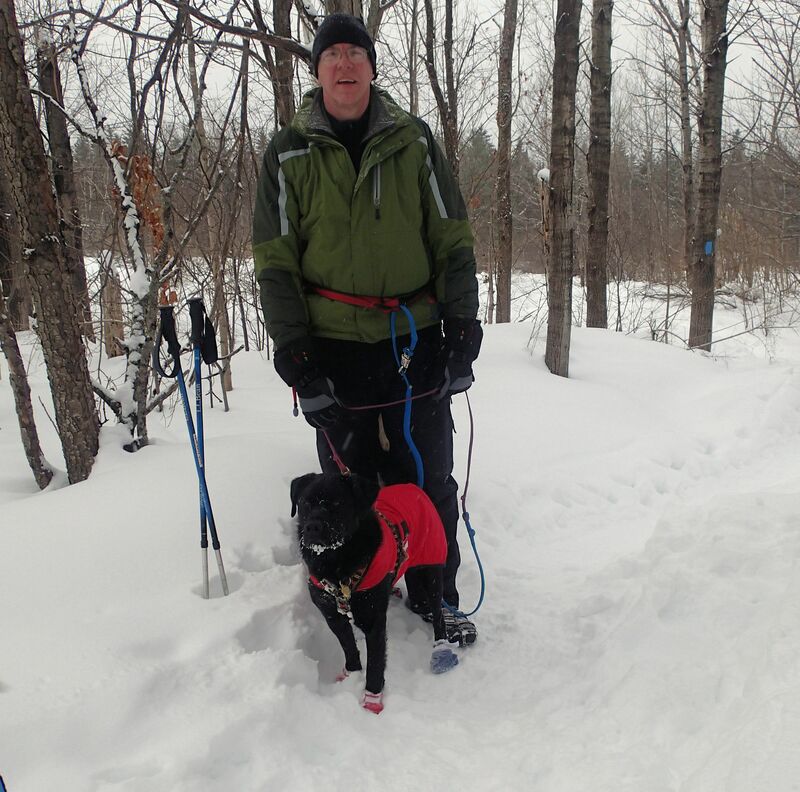 On Valentine’s Day, we took Edgar and his dad to a trail close to our home, that is often too crowded for our taste…we thought, well, it is only 2 degrees, wind chill well below zero, we’ll have it to ourselves. Well, we were wrong…but we did have a nice hike, and the snow on the trail was packed firmly enough that we used our micro-spikes, without any possibility of creating the dreaded post-holes. I did have one “scary” moment which led to an expletive or two…I had not brought my flexible mini-tripod, because it is new, and I did not want to lose it the first day I tried it. So, for a group “selfie”, I used one of natures’ tripods ( which I have done hundreds of times), a nice, flat stump that rose above the 4 feet of snow off the trail. I still cannot fathom how ( the forest gremlins, maybe? ), but the camera fell off the stump, and disappeared into the depths of snow! A few minutes of cussing, and careful sifting through deep champagne powder resulted in Eureka, I found it! Thankfully it is a waterproof camera….but the next time I try this, I will have the camera strap clipped to something for security! Griff near the stump, off of which my camera jumped, all by itself! The great snow conditions, and beautifully groomed trails, led me to Ryder Brook, where I gave Edgar a little skijor practice. He is quite a bit faster than Griff, but he was very patient with me, and we had a great day (even though the promised sun never appeared) Edgar is such a good boy! We entered his funny canoeing photo in a contest, but since we are not into “like fishing” on facebook, his prospects are not good….but we love that photo, and like to share it with others. We have also been selected to be gear testers/reviewers for Backcountry K9 (http://backcountryk9.com/), so we will actually be sharing reviews of some of the gear they sell, or may be deciding to sell…our active dogs are proud to have been selected. Meanwhile, on the home front…great news! Our daughter has announced her engagement, to a wonderful man. 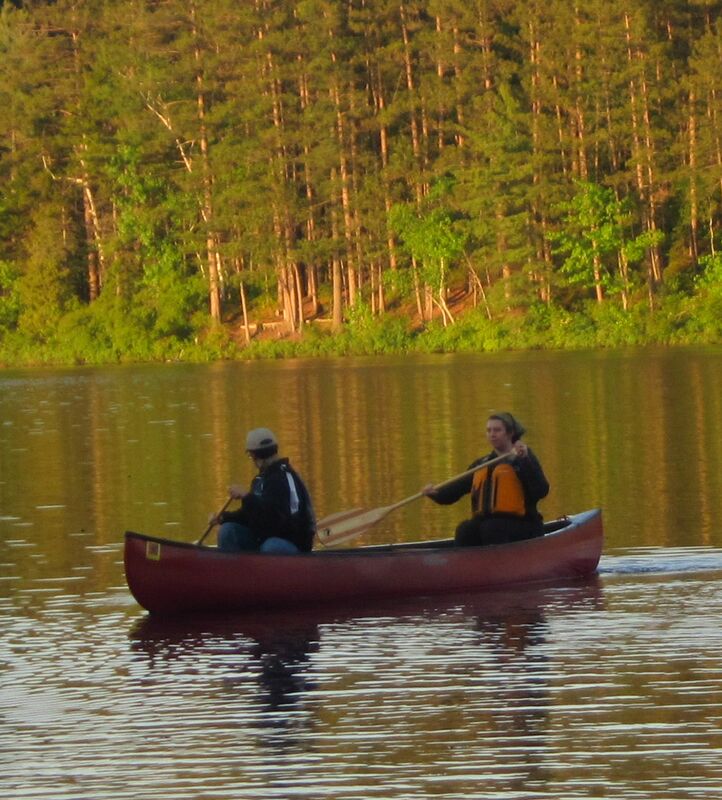 We are so pleased for her and her fiance…in their honor, we share a photo of them in a canoe, when they came camping with us a few years ago…. And with eternal optimism, I say…only 12 weeks until Paddle Season! Great to see you were able to get out there this winter. Our snowshoe treks have been a limited, as your must have been also, due to the recent frigid weather. Great canoeing photo, I’ll go vote! Thanks so much! 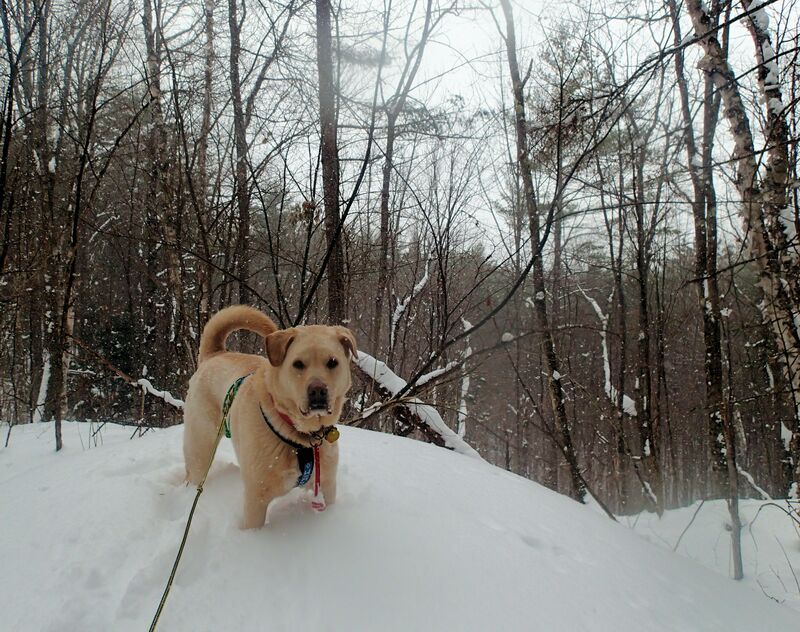 We get out nearly every day, with parkas and booties, dogs (and we) can tolerate down to 10 below, but we are definitely looking forward to spring! What great shots! 23 days til Spring, can’t wait!!! Lets hope all our snow will melt by then! 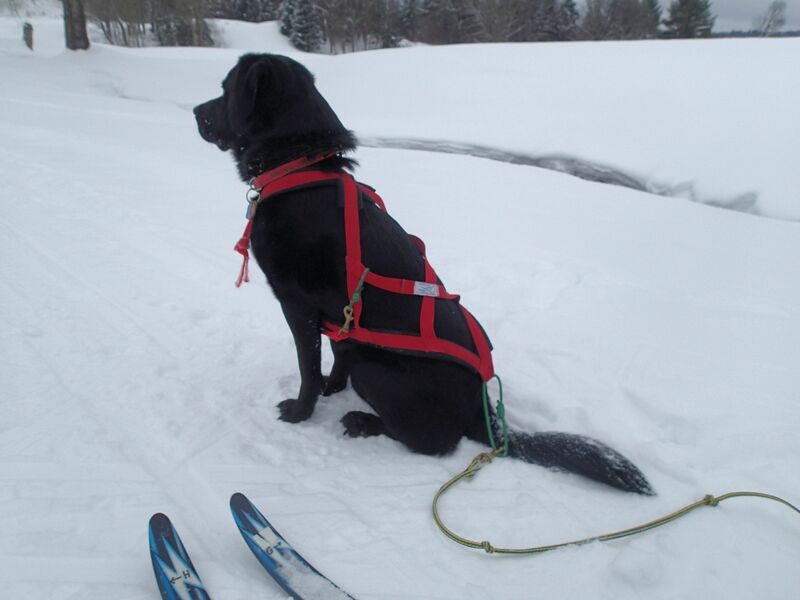 We’ll be snowshoeing until late March…hopefully in warm sunshine! I can’t get over how much snow you guys have! Now that’s what I call “snow” Stay warm and be careful.